A 21-year-old man is on the run after smashing his way through a security screen inside a court in Manchester. 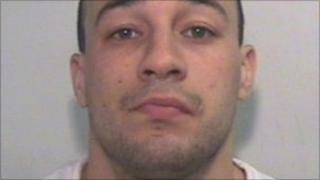 Owen Roche, from Moss Side, was facing an assault charge at Minshull Street Crown Court on Thursday when he made his escape. Mr Roche, who was accompanied by guards from G4 Security (G4S), smashed the plastic screen with his feet and jumped the dock before fleeing the court. A search is under way and police have advised the public not to approach him. Mr Roche was appearing in court five at about 1700 GMT when the incident happened. Despite efforts by security staff to restrain him, he escaped from the court building and has not been seen since. The dock in question is not a secure dock, such as those fully enclosed by reinforced plastic for high-risk prisoners. It is understood the screen Mr Roche smashed was in place to prevent defendants simply leaping over the barrier. A spokesman for the security company said: "G4S staff tried to restrain him and suffered minor injuries in the struggle. "The prisoner kicked out and broke a Perspex screen in the dock during the incident before escaping. "The matter is subject to a full police investigation and we cannot comment further at this stage." Anyone with information is urged to contact Greater Manchester Police (GMP).